Hand Crafted from British Oak. 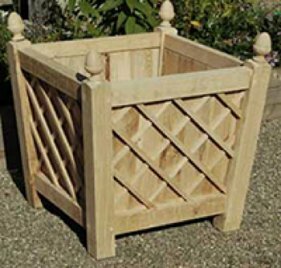 This classic flare shaped Wrekin Wooden Planter is constructed from British Oak. Its volume makes it suitable for the planting of small trees, shrubs or a seasonal planting arrangement. Each corner timber is topped with an acorn style finial. 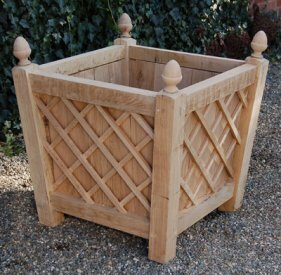 The Wrekin wooden planter's corner posts are 75mm square with 50mm square cross timbers and the sides of the planter are in-filled with 25mm thick oak planks, which have an oak beading lattice decoration. The bottom is slatted to allow drainage and the whole planter is hand rubbed to finish. The internal walls of these planters are now painted with a waterproof paint sealant. Choosing the style of tree you want is the first step. welcome shade, while on a balcony or roof garden it could provide screening. pseudoacacia 'Frisia' in spring offer shimmering colour and gentle movement in a breeze. Dwarf acers and maples have spreading foliage in arresting colours, ranging from the softest pinks to bright crimsons and oranges. The red-barked dogwood (Cornus alba) comes into its own in winter once its leaves have fallen, revealing brilliant red stems. provide a focal point to a patio or terrace. There are five main tree shapes to choose from: the spreading umbrella or tiered shape of a typical acer; a round-headed standard; a cone or pyramid; a tall, thin columnar shape, like a pencil cypress; and the popular weeping shape. A tree will add structure to a collection of planters, and provide year-round interest in a garden. atlantica 'Glauca Pendula'. Many conifers also offer a wide choice of shapes, sizes and colours and will grow well in planters. Some trees can be clipped trained or grafted to create an interesting shape. For example, the slow growing compact Japanese holly (Ilex crenate) has box like foliage which can be shaped into a ball or cone. Trees can produce fruit too, even in planters. The morello cherry (Prunus cerasus) will bear fryit even in a north facing position. Train it against a wall as a fan so that its branches are warmed by the heat from the wall and any available sun. A planter orchard of pear ''Terrace Pearl', peach "Terrace Amber Dwarf) and nectarine "Terrace Ruby Dwarf", will give a spring blossom and, in a warm sheltered site, a good crop of autumn fruit. For a Mediterranean feel, grow a fig or an olive tree. But remember that, although olive trees enjoy summer outdoors in a sunny location, they need to be moved into a frost free place for winter.